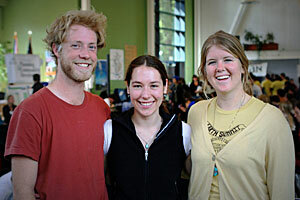 Campus Earth Summit Coordinator Sophie Carrillo-Mandel, left, with volunteers Vanessa Cunningham and Jason Daniel from the Student Environmental Center. David Chang's chocolate chip cookies, baked in an eco-friendly sun oven, didn't stand a chance--they were gobbled up by lunchtime. "I feel like there's been more word spread around," said senior Chang, 21, looking out from his Green Campus Program table at the several hundred people milling about at the eighth annual campus Earth Summit, held Thursday in the College Nine/Ten Multipurpose Room. Over the past seven years, the Earth Summit, organized by the Student Environmental Center, has created and advanced a dialogue among UC Santa Cruz students, faculty, staff, administration, and the larger Santa Cruz community regarding the campus's local commitment to sustainability. 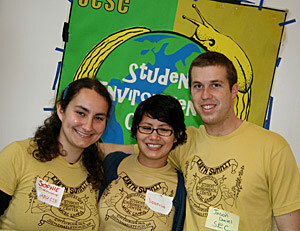 The event was cosponsored by the campus Sustainability Office, which was begun in 2007 as a two-year pilot program. Chancellor George Blumenthal has funded the office for three more years. 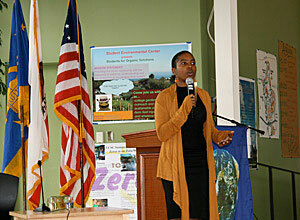 This year's event featured a roundtable discussion on collaborative sustainability efforts at UCSC and beyond moderated by Nikki Henderson of Oakland's Green for All, an organization that advocates for "green-collar" jobs and opportunities for the disadvantaged. The summit also included a poster session detailing campus sustainability progress; educational workshops led by members of the campus community; and topic groups creating shared visions and action steps to a sustainable campus. "Our world is one of the most pressing--if not the most pressing--issues of our time," said Chancellor George Blumenthal in his remarks to the audience. "While we need to focus close to home, it is good to know we finally have an administration in Washington that--at least so far--takes sustainability and climate change seriously." Since last year's summit, the Chancellor's Office has convened the Chancellor's Council on Climate Change; the campus changed its electricity purchasing, not only saving money but also creating a 44 percent reduction in greenhouse gases per megawatt hour used; Dining Services won a $5,000 grant for its comprehensive approach to food service sustainability; and vehicle traffic to and from campus is down to 1998 levels despite a 50 percent growth in enrollment. Luna Miller, 21, a fourth-year art student in Kresge College, was volunteering at the event. She had attended last year's summit and thought it was a "cool gathering." "It's just renewing and inspiring to be around lots of people you know, or don't know, who care about the same thing and come to get renewed inspiration," said Miller. Tim Becker, 22, a fourth-year environmental studies major in College Nine, came to support friends who helped organize the event. But also, he said, "as an environmental studies major, the organizations represented here are things I participate in and care about." Organizations tabling and displaying informational posters at the summit included the Campus Sustainability Council, the Coastal Watershed Council, the Student Environmental Center, Round River Conservation Studies, Ecology Action, the Sierra Institute, and the City of Santa Cruz. The summit also included a free, local, organic lunch for all attendees. With the broad range of organizations represented at the event, many students hoped to meet people with similar interests and get a jumpstart on their futures. "I hope to be able to network and have more of those human resources to be able to expand my own interests and get more involved," said Becker. Shannon Scott, 19, a second-year environmental studies and psychology major in Cowell College, agreed. "It might help me in my career and lead me to other interests," Scott said. Alumnus Vlad Metrik, former co-chair of the Student Environmental Center, said this year's event is the best he's seen. "There are more faculty, department heads, and students here than before," said Metrik, 27, who graduated in spring 2008 and now lives in Emeryville. Metrik was scheduled to facilitate a conversation on green purchasing during the topic discussion period of the day. Organizers hope the event helps shape environmental policy on campus and widens the pool of people interested in environmental issues. "The Earth Summit makes the Blueprint for a Sustainable Campus," said junior Sergio Costa, 19, referring to the compilation of visions generated at each summit that acts as a guiding document. Costa, an environmental studies and economics major in College Eight, now serves as co-chair of the Student Environmental Center. "I hope this year's summit will create good notes for that blueprint," Costa said. "And I hope people get really excited about the environment."